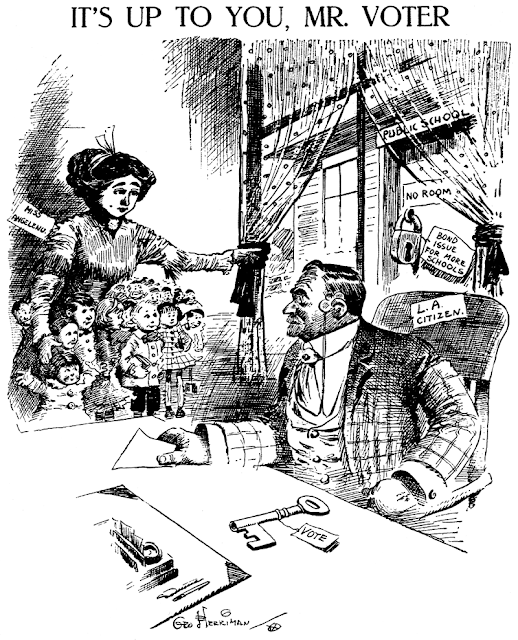 December 30, 1908 -- Herriman registers a plea that voters pass a new bond issue that will build more schools in L.A.
George must have been in a rush, because the perspective is like a fun-house mirror. I have to say, that's a funny place for the Voter to park his pince-nez. 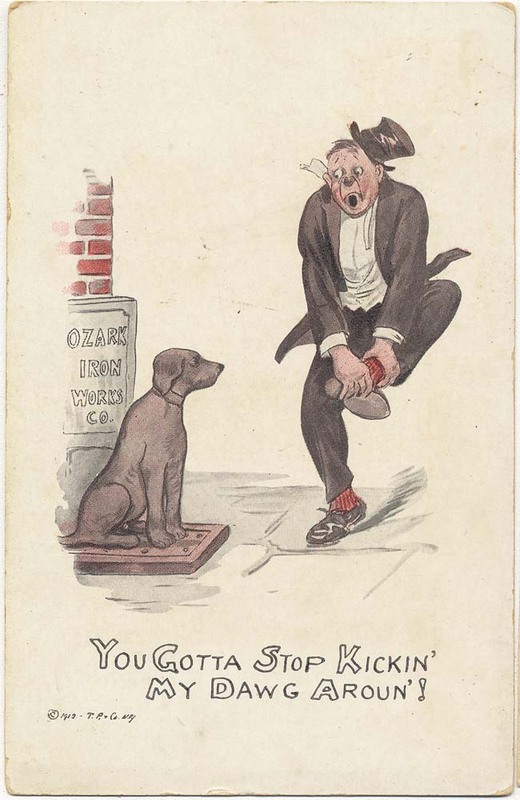 Although unsigned, this 1912 postcard sure looks like early Percy Crosby work to me. It was put out by T.P Company and says 'Series 846' on the back. There really was an Ozark Iron Works, though I doubt that this was made as an advertising card for the company. Odd though that Crosby would have given a specific company name, rather than just "Iron Works." Howzabout that lettering, by the way? Talk about your lack of effort! A quick Google reveals that's an old comedy song title. It's about a cowboy's dog who follows him into town, and the brawl that results when some guys kick the dog around. The drunk just kicked an ornamental iron dog; for him the song title is is practical advice. Ornamental iron dogs were evidently A Thing once. There was a wartime Looney Tune about a dopey hound who fell in love with an inanimate iron dog, chasing it into an armaments factory where it becomes a bomb -- with an explosive kiss ("What a gal!"). That Looney Tune is a Merrie Melodie cartoon" "Ding Dog Daddy" directed by Friz Freleng, Dec. 1942. "T.P." stands for Taylor Platt & Co. They were a NY publisher who also published designs by Albert Carmichael. It makes sense, my Great-Grandfather, Albert Carmichael and Percy Crosby were friends. Walter Clyde Spencer was born in Peoria, Illinois, in December 1873. His birthplace was noted in the American Art Annual Volume 12 (1915) and American Art News, August 14, 1915. The birth date is from the 1900 U.S. Federal Census. The Omaha Daily Bee, May 31, 1897, published an extended assessment of Spencer’s artistic growth. An Omaha boy who has started on the road to fame in New York City is W. Clyde Spencer, the only son of Mr. and Mrs. W. A. Spencer, who reside at 1813 Cass street in this city. The young man attended the Omaha schools until he reached the second grade in the High school. His taste seemed to run to sketching, and after working a year or so in a local retail establishment he started for New York in March of this year. He applied for admission to the National Academy of Design, one of the foremost institutes in the country, and was admitted after a test of modeling. After sixty days’ instruction at this school he entered the newspaper field, and a series of sketches from his pen was accepted by the New York Journal and appeared in the issue of May 15. Mr. Spencer’s only instruction in drawing while in Omaha was that received in the public schools and his success in the metropolis of this country is regarded as most flattering by his friends in this city. The young man is scarcely 21 years of age and his efforts up to this time have been entirely unaided. The Denver Post said Spencer’s first job was on Hearst’s New York American. The World-Herald (Omaha, Nebraska) , July 17, 1915, said Spencer, in 1897, worked on the staff of the World-Herald as a cartoonist, and later employed in a local engraving company. In 1899, Spencer illustrated Waldo Pondray Warren’s Higher Christmas. Denver city directories listed Spencer at several addresses: 1650 Tremont (1902); 318 14th (1903 and 1904); 1844 Sherman Avenue (1905); and 315 14th (1907 and 1908). 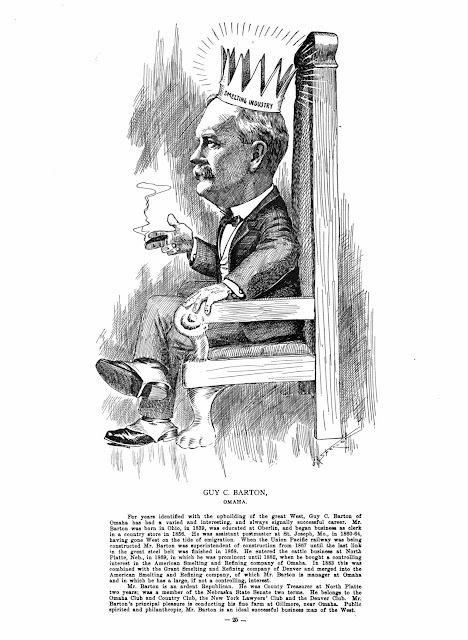 In 1904, Spencer was one of the contributors to Representative Men of the West in Caricature. A few years later, Spencer went to the Kansas City Post. In the 1910 census, newspaper cartoonist Spencer and Beatrice were Kansas City, Missouri residents at 1120 Paseo. Spencer contributed to Uncle Remus’s Home Magazine, August 1910. Around 1911, Spencer accepted an offer from a New York newspaper. According to American Newspaper Comics (2012), Spencer produced two strips for the New York Evening Telegram, A Trip to Mars and There’s a Difference, both in 1911. 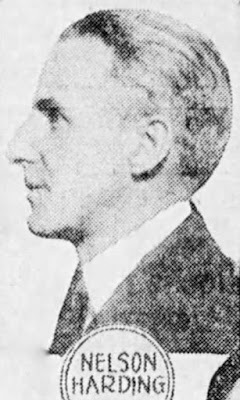 The Denver Post said Spencer did not like New York City and returned to the Denver Republican until it ceased publication in 1913. In 1912, Spencer lived at 1301 Ogden, and in 1913 at 1221 Sherman. Spencer returned to New York City where he created the 1914 strips Safety First! for Press Publishing and What Would You Do If You Walked in Your Sleep for the New York Herald. Spencer also worked as an illustrator and actor for the film company Gaumont. The 1915 New York state census listed Spencer and his wife in New York City at 580 St. Nicholas Avenue. Six weeks later, Spencer passed away July 15 at his home in New York City. His death was reported in the Denver Post and The Rocky Mountain News on July 16. Both papers said word of Spencer’s death came in a telegram from Francis Gallup, a former Denver artist residing in New York City, in the evening of July 15. 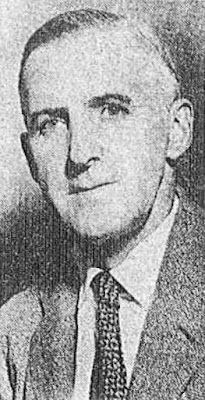 Some newspapers, magazines and books said Spencer died on the 17th. W. Clyde Spencer did not have a particularly memorable career as a newspaper cartoonist. He managed to place a total of four comic strip series in the 1910s: one to the New York Herald, one to the New York World, and a pair to the New York Evening Telegram. It's one of these Telegram strips that should at least earn him a footnote in comic strip history, for it is one of the earliest science fiction strips. Now when I say sci-fi, we aren't talking at the level of Asimov, or even Buck Rogers, or even My Favorite Martian. 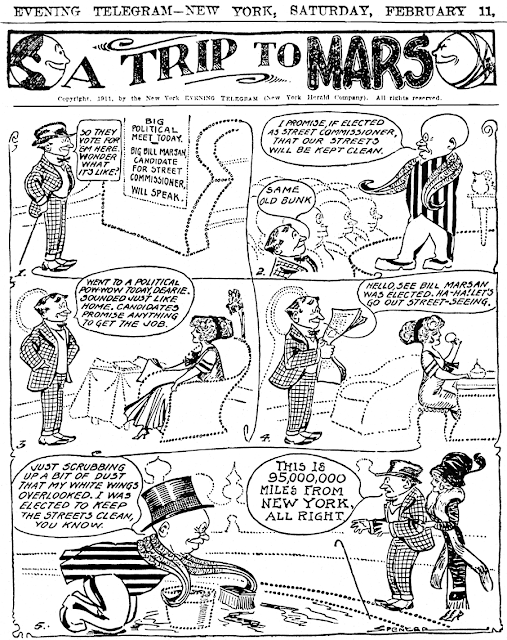 No, Spencer's strip, grandly titled A Trip to Mars, is actually pretty down to Earth in its aspirations. A young couple decide to take a trip to Mars, and they find that it is a very weird world ... but mostly in that the subway runs on time, bosses treat their employees with kindness, and (see above) politicians actually come through on their promises. Spencer's nod to real otherworldliness is that the Martians have tentacles instead of arms, and all the surroundings are drawn as dotted outlines. I'm not sure what the dot conceit is meant to signify -- is everything transparent? Shrug. A Trip to Mars ran sporadically in the Telegram from January 14 to April 19 1911. Very inspirated in Georges Meliés. Harding served in the Spanish-American War. He enlisted in the National Guard May 2, 1898 and was a private in the 71st Infantry Regiment, Company B. The 1905 New York state census recorded Harding, his parents Charles and Flora, and younger sister Flora, in Manhattan, New York City at 180 West 74th Street. Harding’s occupation was artist and his father’s lithographer. Mr. Harding was a pupil at the Art Students League and the Chase School, and at the latter was instructed by Robert Henri, a master of his art and the tutor of a number of men and women who have achieved fame in their profession. Before attaching himself to The Eagle, Harding worked as a lithographer, meanwhile selling his drawings wherever a market could be found. In his free lancing days he became well known for the quality of his work, and found his offerings in good demand. According to the Eagle, Harding joined the Eagle in 1908. The 1910 census recorded the Harding family in Manhattan at 646 West End Avenue. Harding was an artist, his father a painter, and both worked in a studio. Who’s Who of Pulitzer Prize Winners (1999) said Harding married portrait artist Anna Seamon in 1911. American Newspaper Comics (2012) said Harding produced a weekly comic strip under various titles: Dream of the Raw Recruit, Dreams Go by Contraries, It’s Always the Way and Not in a Thousand Years. They ran from May 8, 1910 to April 22, 1911. Ruthless Rhymes for Martial Militants was a panel that debuted March 26, 1913 and ended July 8, 1914. The panels were reprinted in a number of publications such as The American Review of Reviews, Cartoons Magazine and Current Opinion. In 1914, the Eagle published the panels in a book, Ruthless Rhymes of Martial Militants. 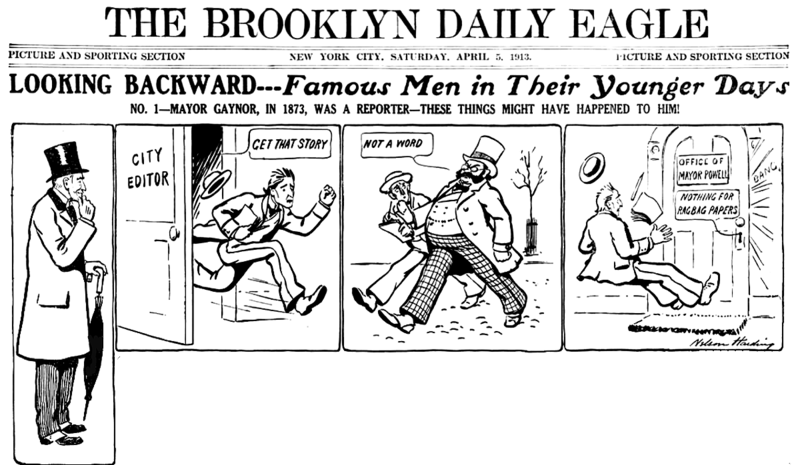 Harding’s Looking Backward—Famous Men in Their Younger Days had a short run from April 5 to May 1913. Harding signed his World War I draft card on September 12, 1918, and was an instructor of troops. His home was in Brooklyn, New York at 290 Brooklyn Avenue. The description of the cartoonist was medium height and build with blue-gray eyes and gray-black hair. In the 1920 census, Harding continued living in Brooklyn but at a different address, 1152 Pacific Street. He had two daughters, Jean, age 7, and Margaret, age 4. The Eagle, January 26, 1921, reported the guest speakers, including Harding, at the Municipal Club of Brooklyn. Nelson Harding spoke in the humorist’s vein on “The Cartoonist’s Day” The cartoonist begins his day, according to Harding, by going through his mail for possible offers of better salaries from other papers. Then he looks around for his pipe or cigars. He continues it by calling up his home to find if the plumber has repaired the water pipes and then going through any other mail that might have arrived for possible offers of better jobs from other papers. Then he has his suit pressed and goes out to lunch. And in the afternoon he leaves the office to attend to errands for his wife, first glancing through the afternoon mail for possible offers of better positions by other papers. Finally, Mr. Harding made a “pathetic appeal,” since the hungry of Europe had been so repeatedly helped, to raise a fund for the relief of the thirsty of America. Harding also produced text pieces for the Eagle such as Hylanwatha. At some point, Harding moved to Yonkers, New York. A 1924 Yonkers city directory listed Harding, a journalist, at 103 Merriam Avenue. The 1925 New York state census had the address as 107 Merriam Avenue. 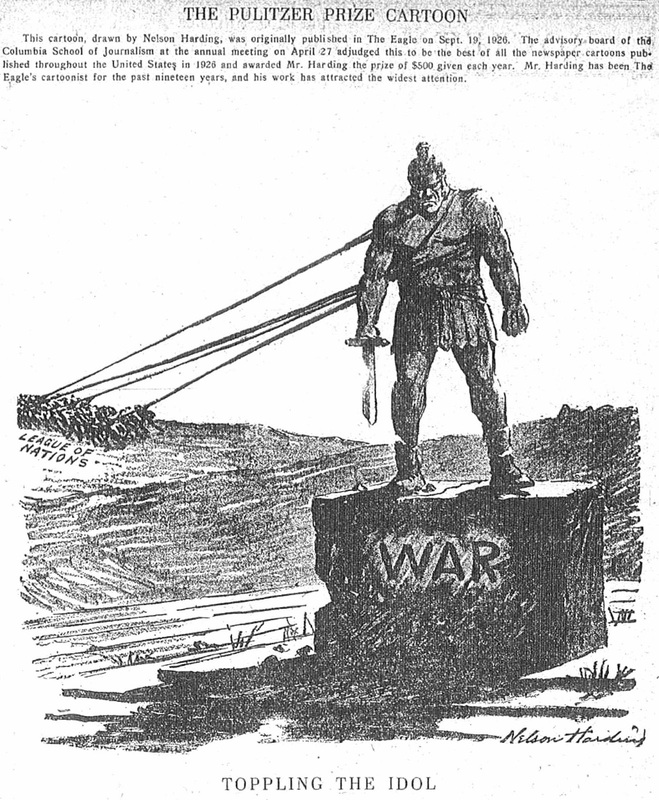 Harding’s editorial cartoon “Toppling the Idol”, published September 19, 1926 in the Eagle, won the Pulitzer Prize for best cartoon. The award was reported in the Eagle on May 3, 1927. Harding wrote about winning the award on May 8. Harding was the first cartoonist to win the Pulitzer Prize for best cartoon two years in a row. His achievement was covered in the Eagle on May 8, 1928. The Brooklyn Standard Union, January 21, 1929, published an advertisement announcing Harding joining the staff of the New York Journal. The 1930 census said Harding was in Brooklyn at 40 Verandah Place. Two newspaper printers also roomed there. Harding has not yet been found in the 1940 census. Harding passed away December 30, 1944, at the Veterans Administration Hospital in the Bronx, New York. His death was reported in the Eagle on January 2, 1945. Harding was laid to rest at Arlington National Cemetery. 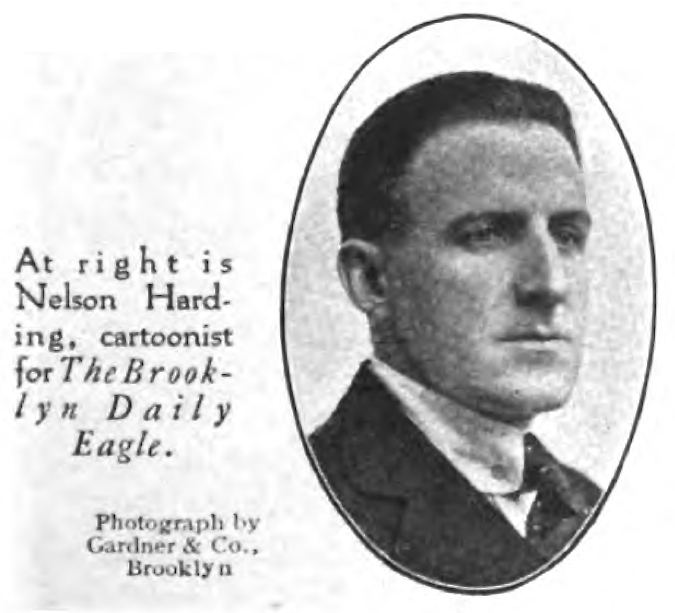 Nelson Harding was the editorial cartoonist of the venerable Brooklyn Eagle from 1908 to 1929, and while there did the amazing feat of winning back-to-back Pulitzers in 1927 and 1928. The reward for this feat came in the form of an invitiation by Hearst to join his organization. Harding accepted the offer, and was promptly swallowed up so thoroughly in Hearst's vast organization that his cartoons were lost in the shuffle from then on. At the Brooklyn Eagle, where he had been the venerated grand old man, his name became mud for jumping ship. I've never been a fan of Harding's editorial cartoons. The art is fine but he had a habit of covering everything in a ticker-tape parade of unnecessary labels. Of his two Pulitzer winning cartoons, one is a ho-hum anti-war message, the other a weakly drawn huzzah to Lindbergh. I doubt that it would take me more than ten minutes of clicking around newspapers.com to find better editorial cartoons from those years. But that's typical for the Pulitzer prizes for cartooning, which employ some utterly mysterious and bizarre methods for evaluating cartoons. Anyway, we're getting far afield. 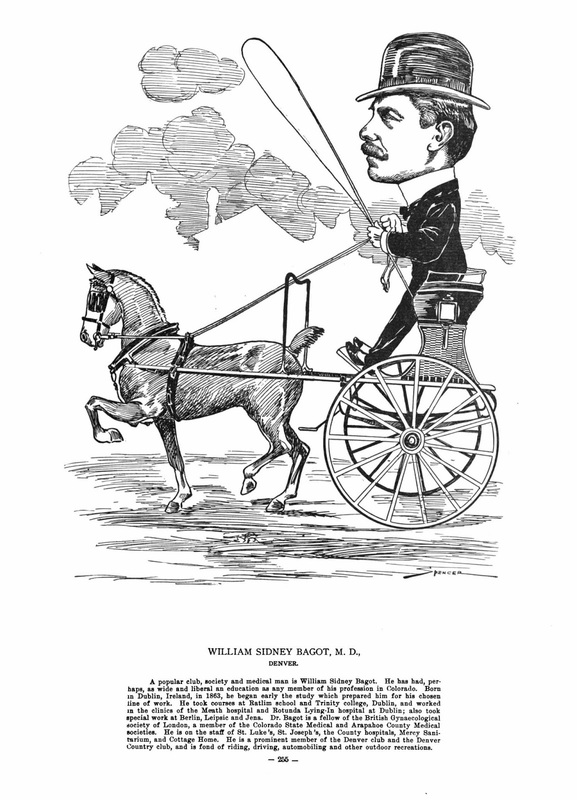 Although Harding's editorial cartoons leave me cold, he was a surprisingly humorous fellow when he felt the muse beckon in that direction. Today's obscurity, however, does not shine a great light on that aspect -- not Harding's fault but rather that the gulf of time has extinguished whatever humor might have been there. Looking Backward -- Famous Men in Their Younger Days is a very short series that ran on Saturdays in the Eagle from April 5 to April 26 (a grand total of four episodes). In each episode a leading light in New York politics is satirized based on jobs they held in their younger days. The strips may have been knee-slappers then, but you'd have to be a historian of New York politics to get any humor from them now. Just to beat a dead horse (is anyone still reading? hello?) the four installments covered, in order, New York City mayor William Gaynor, Brooklyn borough president Alfred E. Steers, NewYork City controller William A. Prendergast and Timothy L. Woodruff, one-time lieutenant governor of New York state. Well maybe it isn't that hilarious, but the strip about Prendergast is doing a parody of a song from Gilbert and Sullivan's "H.M.S. Pinafore", which was considered a comic opera in it's day.